Time to dust off the ol' slow cooker! The beauty of Crock-Pot cookery is that it's not just for dinner. We've got the deets on how to make yogurt, oats, lasagna, and cheesecake all without slaving over a hot stove. While your goodies hang out in the Crock-Pot, take some time to check out our killer roundup of resistance band exercises plus a ton of tips to be more productive at the gym, from supersets to fueling up your energy tank. And for some more gym inspiration, grab a few pointers from Lorna Kleidman, the World Kettlebell Champion. 77 Healthy Crock-Pot Recipes Too crunched for time to cook? No such thing when there’s a slow cooker in the house! Try one of these 77 recipes that minimize time spent in the kitchen and maximize flavor and healthy ingredients. Off the Grid: Why I Still Use a Dumb Phone OP-ED: What “dumb” technology has to do with getting lost, and how it’s helped one Greatist staff writer experience the world, cultivate relationships, and improve herself. Health and Fitness Trends to Watch in 2013 Super supplements, high tech healthcare, and an end to bacon? We asked some of the biggest names in health and fitness for their predictions for 2013. Read on to get a leg up on the New Year! Why Colleges Around America Are Dropping PE Requirements OP-ED: Bad news for gym class all-stars heading to college — in 2012 only 39 percent of American colleges and universities had physical education requirements. What does that mean for student’s mental and physical health? Legit Barefoot Running Shoes That Are Made from Medieval Armor New, chainmail-like PaleoBarefoots claim to provide the same comfort and protection as other types of minimalist wear while making runners feel more connected to the ground. The 8 Best Physical Therapy Methods Explained The road to healing an injury often involves being poked, prodded, and even shocked. Greatist sorts through the most popular physical therapy methods that help you feel, look, and move better. 33 Resistance Band Exercises You Can Do Anywhere If you’re on-the-go, tight on time, or short on space, get in a great workout with these resistance band exercises. Read on for 33 sure-fire moves that will work the entire body. 17 Smart Ways to Be More Productive at the Gym Want to get more out of your workout? Here are 17 tips to hack time spent at the gym and be more productive. Fitness Reborn: The Real Way to Get Back in Shape COLUMN: Renowned fitness author and journalist Adam Bornstein takes us through his path from gym newbie to fitness guru. Read on for the must-know on getting back in shape (or just better shape). In the Gym With Lorna Kleidman, World Kettlebell Champion Ready to get in on the kettlebell craze? Read on for three-time world kettlebell champion Lorna Kleidman’s takes on the dynamic strength training tool — kettlebell workout included! A Montage of Montages That Will Make You Sweat (Video) Need a little inspiration to hit the gym? This montage of training montages may just motivate you to throw on a sweatband and get moving. Moderation Not Deprivation: Why You Should Eat That Cookie GUEST POST: Yael Cohen, the founder and CEO of F Cancer, knows a thing or two about health. She also knows a thing or two about indulging in a cookie. Here, she explains why a healthy diet is about moderation, not deprivation. Sipping Sadness: New Study Links Sugary Drinks to Depression A new study suggests soda, sugary drinks, and diet drinks are associated with an increased risk of depression. 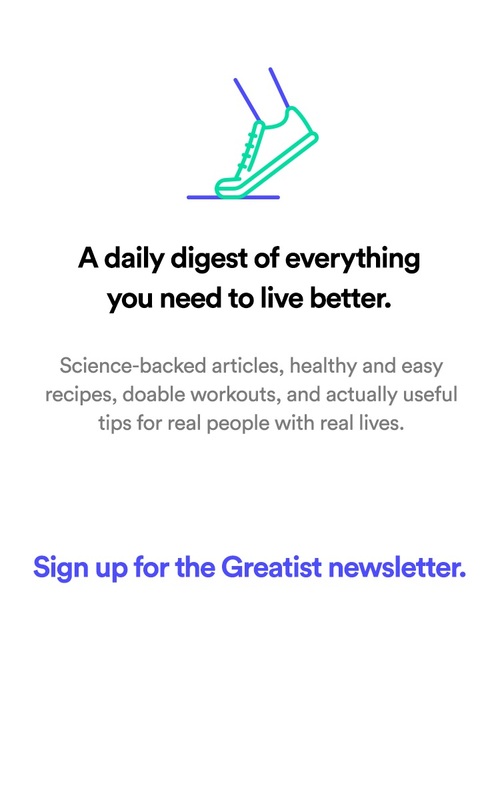 Healthier Choices in January From Around the Web #imagreatist Drinking more water, doing CrossFit, and trying new workouts. These are just some of the awesome healthier choices the greatist community is making in 2013. New Study Finds a Potential Cause of Obesity It’s not all fruits, veggies, and the treadmill. New research suggests the absence of a protein called p62 may contribute to obesity and other problems related to metabolism. 8 Natural Foods to Eat for Pain Relief Greatist has compiled a list of everyday foods that fight pain. Incorporate them into a healthier lifestyle to reap the benefits long-term. Survey Says: Fewer Americans Are Dieting, Especially Women New Year’s diets may soon be a thing of the past: A new survey finds fewer American adults are dieting at the same time that cultural attitudes about weight and attractiveness are shifting. The Greatist Table: 5 Healthy Detox Recipes from Around the Web Ready to turn over a new leaf? Try these healthy, balanced recipes to get back on track in 2013. Resolutions? We'll Be Drinking Again by February, Says Mark Twain A New Year brings New Year’s Resolutions. We’re planning on keeping ‘em, no matter what Mark Twain says. Unlimited Protein and Apps: This Week's Must-Read News Facts Haven’t had time to keep up on the news this week? 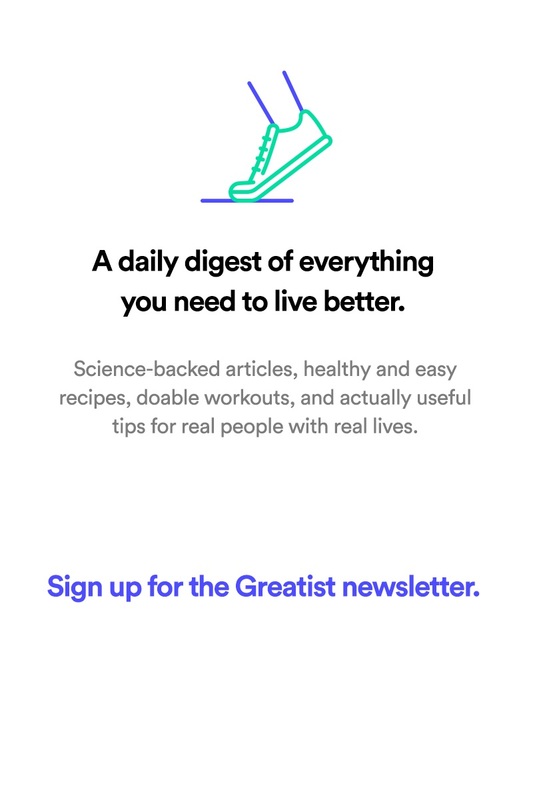 Not to worry — we’ve summarized the top news stories that could significantly change our health habits. Recipe: Cheesy Stuffed Tomatoes Need a quick, filling, vegetarian-friendly snack or easy lunch? Try these simple (and super cheesy) stuffed tomatoes. New Poll Reveals Americans Unsure How to Fight Obesity A new poll finds Americans are united in their concern about the growing obesity epidemic, but we’re divided on what the government should do about it. U.S. Is Unhealthier Than Any Other Rich Country, Report Says A new report finds the U.S. ranks below 16 other countries in terms of overall health and mortality rates. Read on to see why America ranks so low. Recipe: Easy Coconut Granola This easy and flavorful granola can bring crunch to any healthy breakfast, from Greek yogurt to the top of pancakes! The Ultimate Guide to Quitting Smoking New Year, new, tobacco-free you! Make 2013 a great year by quitting smoking and making it stick. Got Brown Eyes? People May Think You're More Trustworthy Researchers put people’s faces to the test to see which ones exuded trustworthiness. Verdict: Eye color may have something to do with it. How Blinking Could Help Your Brain Learn New Information A new study suggests blinking causes some pretty important shifts in brain activity. Could all those blinks be the key to learning new information? 6 Ways to Fight Seasonal Affective Disorder (SAD) Winter often brings a lot more snow and a lot less sunshine. But those who experience depression every year during chilly weather might suffer from seasonal affective disorder (SAD). Time For a Raise? Rich People Are Happier, Study Says New research suggests that, the more money we have, the happier we are. Find out how money affects our outlook on life.